Pregnant and nursing mothers need clothing that allows them ease of movement at all times. Mee Mee's Soft Cotton Leggings with Rib for Mommies are versatile & trendy. Pair these with kurtis, long tees, tunics and shirts to look stylish all through motherhood. The stretchable rib waistband gently covers the growing bump and ensures the mother is at her comfortable best always. Additional Information: Mee Mee is a well-known brand in India owned by the company Me n Moms Pvt. Ltd. Launched in the year 2006, the brand promises to fulfill, The Joy of Parenting to every parent with their high quality and innovative baby and maternity care products that follow all safety norms and relevant safety standards. 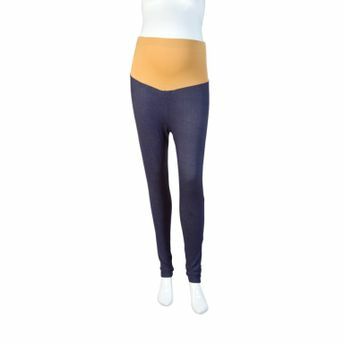 Alternatively, you can also find many more products from the Mee Mee Soft Cotton Maternity Leggings with Rib - Denim Blue range.